Want to begin your search for used Jeeps for sale in Indiana but are not sure which dealership to go to that offers great deals on used Jeeps? Then you need to make your way over to Acra Automotive Group. The Acra Automotive Group has four conveniently located car dealerships with almost fifty used Jeeps for sale in Columbus, Greensburg, and Shelbyville, Indiana. With our extensive selection of used Jeeps for sale, there is used Jeep that will fit just about any lifestyle need at a price you can afford at Acra in Shelbyville, Acra in Columbus, and Acra in Greensburg, Indiana. Let our experienced sales team show you just how easy getting used Jeep can be at Acra Automotive Group. The used Jeeps for sale at Acra Automotive Group include everything from a used Jeep Cherokee Latitude for sale to a used Jeep Wrangler Unlimited for sale at our car dealerships in Columbus, Greensburg, and Shelbyville, Indiana. Get ready for some summer sun when you take the top off of the 2013 Jeep Wrangler 4WD Sport for sale at Acra Automotive Group. This used white Jeep Wrangler has removable soft top and doors to get the whole Jeep experience. Steering wheel controls, four-wheel drive, air conditioning, and cruise control are only a few of the great features on this used white Jeep Wrangler. 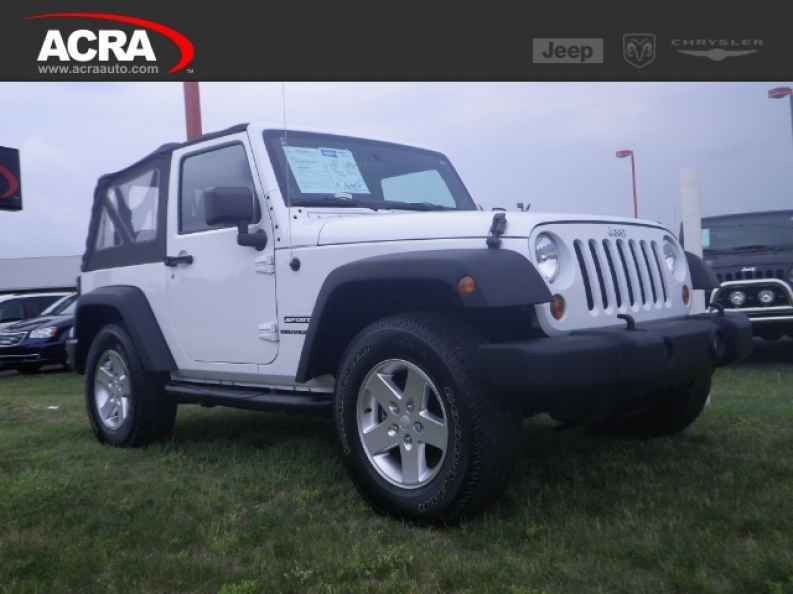 If the used white Jeep Wrangler is not what you are after, check out one of our many other used Jeeps for sale in Indiana at Acra Automotive Group. Come to your local Acra Automotive Group car dealership in Columbus, Greensburg, or Shelbyville to see all we have to offer you today in used Jeeps for sale. You can find the Acra Automotive Group car dealerships at Acra Pre-Owned Superstore located at 2820 North National Road in Columbus, IN 47201; Acra Pre-Owned Superstore located at 1200 East State Road 44 in Shelbyville, IN 46176; Acra Chrysler Dodge Ram located at 1407 North Lincoln Street in Greensburg, IN 47240; and Acra BuyRight located at 920 North Michigan Avenue in Greensburg, IN 47240.